The Bulls Wednesday pushed open the coffin that many around the NBA had predicted for them with a 117-95 victory over the Detroit Pistons. No, they ain’t dead yet. The Bulls got a season high 28 points from Nikola Mirotic leading five Bulls in double figures in one of the team’s most effective offensive games of the season. Of course, coming after three quarters of one in Tuesday’s loss in Toronto. The Bulls had 36 assists and shot 58.8 percent overall and 47.8 percent on threes. The Bulls had a 22-11 edge on fast break points. Joffrey Lauvergne, drafted into emergency, duty, had 17 points and seven rebounds. Jimmy Butler had 16 points and 12 assists with only six of six shooting. Paul Zipser added 15 points and Bobby Portis had 12. The Bulls tied the Pistons for ninth in the East, both at 34-38. The Bulls were without suspended Robin Lopez and Cristiano Felicio, who was injured in a fall against Toronto. Dwyane Wade is out for the season. Cameron Payne returned from the D-league assignment. So Lauvergne started at center and scored first for the Bulls on a finger roll. 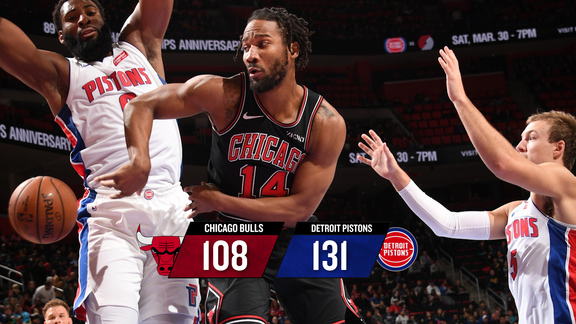 The teams traded baskets through the first half of the first quarter with the Pistons leading 13-12 when the Bulls, ignited with a full court Mirotic drive for a score an Rajon Rondo three, hit the Pistons with a 13-0 run and led 32-23 after one. The Bulls shot 61 percent with Lauvergne scoring six points. The Bulls looked swift and unselfish on offense once again, certainly for the half. Jerian Grant for back in the rotation, Paul Zipser made a fancy, driving scoop shot and Michael Carter-Williams went full four for a left handed layup, the Bulls with 16 first half fast break points to five for Detroit. That gave the Bulls a 43-31 lead. The Pistons came back on a pair of Stanley Johnson threes and got within 50-46 before Mirotic with a three and going all the way on another fast break gave the Bulls a 59-53 halftime lead. The Bulls with 17 first half assists and the ball not sticking shot 55.6 percent in the first half and battled on the boards, trailing just 24-22 despite their two top centers out. The Bulls continued their spirited play to open the second half with Butler being denied a drive for a three-point play, getting a common foul. Butler came back with a jumper and foul for a three-point play and 11-2 Bulls start to the third quarter for a 70-55 lead. Mirotic continued his aggressive play with an unlikely driving scoop for the 15-point lead. The Bulls pushed that up to 81-61 on a pair of Butler free throws after a Rondo steal led to a fast break. Detroit came back with five quick points, but Mirotic continued to come up with big shots and even tough plays squaring up on defense. The Bulls went into the fourth quarter leading 91-73. Portis fought back doing the backup center duties against the Pistons front line and picked up a pair of baskets with movement as the Bulls continued to lead 98-80 midway through the fourth and then pulled away on threes by Mirotic, Zipser and Lauvergne.